You're right about the floor inlay! What a insidious reminder that the bed is "where it's at". A year or two ago, I went to a presentation by Holly Kennedy who did research in the UK looking at maternity care practices in a district in London with excellent "normal birth" rates. There was a high home birth rate in this district, but she focused on what was going on in hospitals, where the outcomes were also excellent. 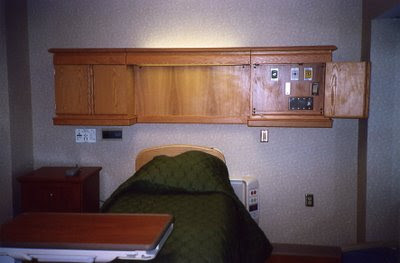 One of the things she noticed is that, while the labor bed is still central in the room, the cleaning staff are instructed to return it to the most elevated position after cleaning the room. Then, when the next woman is admitted, there isn't an expectation that she will get straight into the bed. Instead, the bed was most commonly used as a place for the midwives to spread out their paperwork. They also kept EFM machines in the hallway and only rolled them in whenever needed. 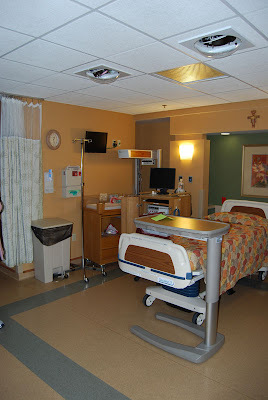 Lots of little tricks to transform a typical labor room into one that encourages mobility. With all that said, I too would love to see the room described in Hodnett's research. As always, thanks for the link to Science & Sensibility! I hate hospital birth rooms. You're right - they all center around the bed. I remember pacing anxiously around the room when in labor with Jameson, looking for *something else*...but there was just wall, wall, machine, wall, bed, wall, wall. The "furniture" is part of the wall so that doesn't count either, and as we all know it's just designed to cleverly conceal more machines. I was recently discussing with a friend the layout of hospital birth rooms. I had never thought much about the bed being the center of attention. (Of course, I don't think much of hospital birth). 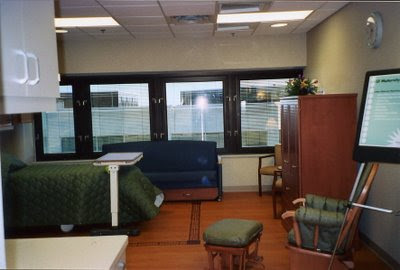 But, I was talking about how hospitals are trying to make the rooms seem "homey", yet when delivery time comes, the spotlights come out, the shiny utensils are wheeled in, and the room transforms so much, you wouldn't recognize it! I love the photo of the french birth room with the low bed in the corner. I love this. So my main question is, did the OBs get on their knees to catch the babies? Which of course is possible, but doubt many I have seen in action would be willing to. Not only are most hospital births about the bed, but also the stupid machine. Everyone watches the machine and not the mom. It would have been physicians attending, not midwives: "Women attended by midwives or doulas were excluded from participating, effectively creating a study population not predisposed to be mobile in labor," writes Goer. Sorry, I was aware (from having read the study) that the women didn't actually give birth in the rooms, but forgot that Henci hadn't said as much in her article. So I was assuming Sheridan's question was about the UK hospital I was talking about in my previous comment. "The standard labor bed was in the room for 0 to 25 percent of the time for 6 (20.6%) women, 25 to 49 percent of the time for 14 (48.3%) women, 50 to 75 percent of the time for 4 (13.8) women, and more than 75 percent of the time for 5(17.2%) women. One woman never used the standard labor bed; she gave birth on the floor mattress. Reasons for returning the standard labor bed to the ambient room were as follows: request for epidural analgesia (n = 18); artificial oxytocin infusion (n = 2, including 1 who was also having epidural analgesia); amniotomy (n = 2), physician request at time of delivery (n = 2); continuous electronic fetal heart rate monitoring needed (n = 1); woman requested standard bed (n = 3); and refusal by the charge nurse to allow setup of the ambient room (n = 1)." I delivered in a hospital with a midwife practice. 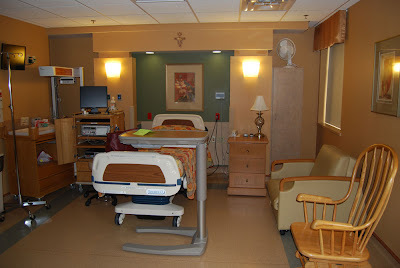 It was in a "regular" hospital, but they reorganized the room for their "homestyle" births. They pushed the beds to the corner, put a futon on the floor, and broke out the birth stool. They had pools, also, but I labored at home and was too late for that. If they had asked me to get into a bed, I don't think I physically could have. I only felt comfortable on the floor. What I love is that it doesn't "cost" the hospital very much to do. Actually, they may save a few bucks if they didn't have the fancy monster beds. That's cool that the midwives did their own "interior decorating"! I totally understand the feeling of not being able to get in bed. During both of my labors, once I knew it was the real deal and gave up on trying to sleep, I never once got near a bed or even laying down on a couch! I had to be upright, preferably leaning over something. 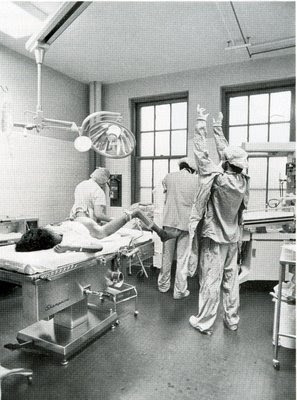 "...refusal by the charge nurse to allow setup of the ambient room (n = 1)." No offense to nurses, but why would a nurse be allowed to refuse the ambient room set up? I guess it's possible that the mom was ambivalent about it and just went with what the nurse wanted? Interesting study. Having taken Wiesinger's "What Would Mammals Do" from Conscious Woman, I know how important the L&D environment is for physiological birth. It's why so many of us that understand and value true physiological birth prefer to stay home or go to a home-like environment such as a birth center. I often elevate the bed so women can stand up and lean on it. That way they are not encouraged to climb in the bed. I also like to walk to the nursery with the Mom to be and spouse. We have handles on the walls in case she needs to stop. I like to position them in the window of the nursery and pick up babies to encourage them. Mom's love to see new fresh babies. It makes them happy. SO I love to take these trips with new moms. Years ago when Epidurals were not readily availible, I would give women 10 IV of nubain with phenergan and 10 im. THen I would encourage them to take a nice tub and I wouls insert and IV since the hot water would make their veins huge!!!!! so they would be an easy stick. I would show the spouse how to pour warm water over her belly and play nice music to calm the whole room. Then she would pop up and say, "Pinky, the baby is coming!" I would check her and most times yes the baby was coming. IT was a nice birth. I miss those days! I never thought I would but I do. Wait, I'm confused - they put a standard bed back in the room for the birth? Except for just one birth? That's kind of a bummer. I was thinking the set up sounded kind of nice. I wonder if I'm allowed to share pictures of our labor suites? I'll email you some if I am. We have no inlay on the floor, but the bed is still the central focus, complete with the ceiling lights and all. We still try to keep clients out of them if we can. My client who birthed her baby today was barely ever in the bed and barely on the monitor (we do intermittent monitoring when we can.) This makes my nurses happy because it greatly decreases how much charting of fetal heart rate monitoring they have to do! Oddly, after an entirely upright labor this mama birthed her baby lying on her back by choice as she felt more comfortable - since she had a 6 minute second stage even being a little upright at the end just felt too intense. I was hoping this study encouraged births in the study set up - it's good for docs to get down on the floor! I would also have to say that the bed is another way, dating back to the victorians, to emphazize that womenhood, pregancy, labor, and birth is a sickness that when you are sick you need to lay down.